4.3 What are the Classics? 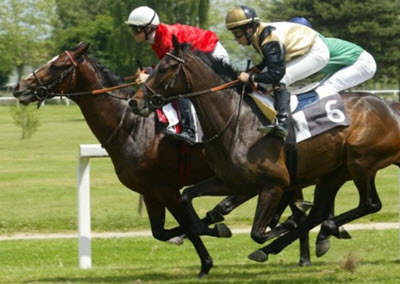 Flat racing is a type of horse racing that takes place on a level racecourse. There are no obstacles for the horse to jump over, such as ditches or hedges. Unlike harness racing, a jockey will be mounted on the horse during flat racing. Flat caring is run over a predetermined distance. The shortest races are just 2 furlongs (402 meters) while the longest ones are 3 miles (4,828 meters). Flat racing takes place on a special track surface. In Europe, the most common surface is turf (grass), while dirt dominates in the United States. The dirt is often local soil mixed with sand and then harrowed. Artificial surfaces also exist and are a common choice for winter races in Britain. Artificial surfaces are usually created by blending sand with a synthetic fiber or rubber, often coated with wax or similar. Generally speaking, flat races on dirt tend to have the fastest pace, while turf racing often comes down to a sprint in the stretch. For artificial surfaces, the nature of the race will depend on the exact composition of the material, with many of these artificial surfaces being constructed to fall somewhere along the spectrum between turf and dirt. Compared to dirt surfaces, turf surfaces tend to be more impacted by changes in the weather, and many turf racehorses have very strong preferences when it comes to exactly how they need the turf to be to perform at their very best level. The dominating horse breed for flat racing is the thoroughbred. In Great Britain, most flat races fall into either of two categories: Conditions races and Handicap races. The shortest races are 5 furlongs (1,000 meters) while the longest ones exceed 2 miles (3,200 m). Depending on the distance, a race is classified as a sprint, middle distance, or stayer. The official handicapper of the Jockey Club gives each horse a different weight to carry, in accordance with its ability, to make the races more exciting. This makes it difficult to predict which horse will win the race, even when unequally skilled horses participate in the same race. This category consists of Pattern races (also known as group races) and Listed races. The Listed races are considered less prestigious than the Pattern races. 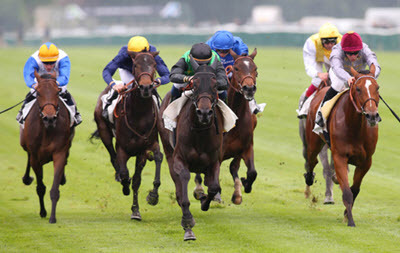 The Classic Races are five famous annual flat races restricted to 3-year old intact horses. Two of the races are even more restricted and open to fillies only. The first flat race track in the United States was built on Long Island in 1665, but it would take until 1868 before the American Stud Book was established and the American Jockey Club wasn’t formed until 1894. Today, a majority of flat races in the United States are written for and limited to Thoroughbreds, although specific races for the American Quarter Horse are fairly common in the western part of the country. Flat races are also held in the U.S. for Arabian horses, Appaloosas, and American Paint horses, but on a rather small scale. There is even a small circuit for mule flat racing. The highest level races are called Graded stakes races (Grade I, II and III). The classification is based on the entry stake put up by the entrants. Just like in the UK, there are handicap races in the U.S. There are also allowance races and weight for age divisions. 1.25 mile (2,010 m) is the classic distance used for the Kentucky Derby and the Breeder’s Cup Classic. Races up to 1 mile (1,600 m) are common in the United States. Races exceeding 1.5 miles (2,400 m) are uncommon. The few that are held are generally held on turf instead of dirt and are designed to attract Europeans.